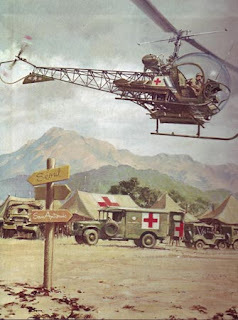 The Bell-47 helicopter was used for medical evacuation of injured soldiers during the Korean war. Click on the title link for more information. that's right...serial number 16. 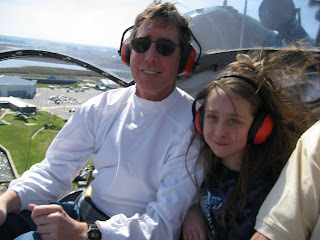 I'd never flown in a Bell-47 but it was my favorite helicopter as a kid watching "Whirlybirds" on our black-and-white TV set after school each day at 4pm. I'm pretty sure this is the 2nd OLDEST aircraft I've ever flown in. (The oldest for me is a 1929 Travel-Air biplane). 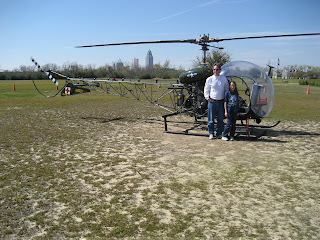 The pilot, who flew the LEFT seat, was nice enough to snap a photo of us after the ride. The pilot-in-command usually rides in the RIGHT seat on a helicopter...backwards from a fixed-wing aircraft. Our ride was short but cheap at $20 per passenger. 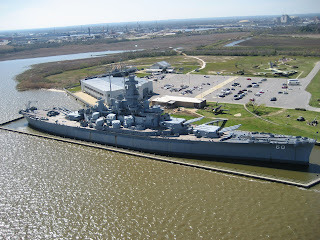 We got a great view of the USS Alabama battleship anchored in Mobile Bay. From the look on Sarah's face she had a good time!